"Yakima" redirects here. For other uses, see Yakima (disambiguation). On May 18, 1980, the eruption of Mount St. Helens caused a large amount of volcanic ash to fall on the Yakima area. Visibility was reduced to near-zero conditions that afternoon, and the ash overloaded the city's wastewater treatment plant. According to the United States Census Bureau, the city has a total area of 27.69 square miles (71.72 km2), of which, 27.18 square miles (70.40 km2) is land and 0.51 square miles (1.32 km2) is water. Yakima is 1095 feet above mean sea level. Yakima, Washington as seen from the west. The Naches River forms the northern border of the city. Several small lakes flank the northern edge of the city, including Myron Lake, Lake Aspen, Bergland Lake (private) and Rotary Lake (also known as Freeway Lake). These lakes are popular with fishermen and swimmers during the summer. Yakima has a semi-arid climate (Köppen BSk) with a Mediterranean precipitation pattern. Winters are cold, with December the coolest month, with a mean temperature of 28.5 °F (−1.9 °C). Annual average snowfall is 21.7 inches or 0.55 metres, with most occurring in December and January, when the snow depth averages 2 to 3 inches or 0.051 to 0.076 metres. There are 22 afternoons per year in which the high does not surpass freezing, and 2.3 mornings where the low is 0 °F (−17.8 °C) or lower. Springtime warming is very gradual, with the average last freeze of the season May 13. Summer days are hot, but the diurnal temperature variation is large, exceeding 35 °F (19.4 °C), sometimes reaching as high as 50 °F (27.8 °C) during that season; there are 34 afternoons of 90 °F (32.2 °C)+ highs annually and 3.2 afternoons of 100 °F (37.8 °C)+ highs. Autumn cooling is very rapid, with the average first freeze of the season occurring on September 30. Due to the city's location in a rain shadow, precipitation, at an average of 8.22 inches or 209 millimetres annually, is low year-round, but especially during summer. Extreme temperatures have ranged from −25 °F (−31.7 °C) on February 1, 1950, to 110 °F (43.3 °C) on August 10, 1971. There were 33,074 households of which 33.2% had children under the age of 18 living with them, 44.7% were married couples living together, 15.7% had a female householder with no husband present, 6.3% had a male householder with no wife present, and 35.3% were non-families. 28.7% of all households were made up of individuals and 11.9% had someone living alone who was 65 years of age or older. The average household size was 2.68 and the average family size was 3.3. 28.3% of the population was under the age of 18 and 13.1% were 65 years or older. The median age was 33.9 years. 50.7% of the population was female. The median household income was $39,706. The per capita income was $20,771. 21.3% of the population were below the poverty line. Yakima is one of the ten First Class Cities, those with a population over 10,000 at the time of reorganization and operating under a home rule charter. They are permitted to perform any function specifically granted them by Title 35 RCW (Revised Code of Washington). All-America City Award. In 1994 and 2015, the City of Yakima received the All-America City Award, given by the National Civic League. Ten U.S. cities receive this award per year. The citizens of Yakima are represented in the Washington Senate by Republicans Curtis King in District 14, and Jim Honeyford in District 15, and in the Washington House of Representatives by Republicans Chris Corry and Gina Mosbrucker in District 14, and Republicans Bruce Chandler and Jeremie Dufault in District 15. At the national level, the two U.S. senators from Washington are Democrats Patty Murray and Maria Cantwell; Yakima is part of Washington's US Congressional 4th District, currently represented by Republican Dan Newhouse. Cultural activities and events take place throughout the year. The Yakima Valley Museum houses exhibits related to the region's natural and cultural history, a restored soda fountain, and periodic special exhibitions. Downtown Yakima's historic Capitol Theatre and Seasons Performance Hall, as well as the West-side's Allied Arts Center, present numerous musical and stage productions. Larson Gallery housed at Yakima Valley Community College present six diverse art exhibitions each year. The city is home to the Yakima Symphony Orchestra. The Yakima Area Arboretum is a botanical garden featuring species of both native and adapted non-native plants. Popular music tours, trade shows, and other large events are hosted at the Yakima SunDome in State Fair Park. The film The Hanging Tree (1959) was shot entirely in and around Yakima. Central Washington State Fair, held each year in late September at State Fair Park. Yakima Folklife Festival, held the second week of July at Franklin Park. Fresh Hop Ale Festival, held each October in Downtown Yakima. A Case of the Blues and All That Jazz, held in August in Sarg Hubbard Park. The Sun Dome was home to the Warriors and Sun Kings. The Yakima Mavericks are a Minor League football team in the Pacific Football League and plays at Marquette Stadium. The Yakima Beetles American Legion baseball team, 3-time World Champions. The Yakima Valley Pippins are a collegiate wood bat baseball team that play in the West Coast League. The Yakima Sun Kings was a Continental Basketball Association franchise that won 5 CBA championships and disbanded in 2008. The team was reinstituted in 2018 as part of the North American Premier Basketball league. The Yakima Bears minor league baseball team, moved to Oregon after the 2011 season. The Yakima Reds American soccer team played in the USL Premier Development League disbanded in 2010. Interstate 82 is the main highway through Yakima. The highway runs north and south, but is sign-posted east and west. Northbound traffic is posted west, since this heads towards Seattle, and southbound traffic is posted east since this heads towards Salt Lake City. U.S. Route 12 crosses through the city from White Pass. U.S. Route 97 joins I-82 from Yakima for approximately 40 miles (64 km) north to Ellensburg. State Route 24 terminates at Yakima and is the primary means of reaching Moxee City and many of the area's agricultural areas to the east. State Route 821 terminates near Yakima and is also called Canyon Road because it passes through the Yakima River canyon. It is an alternate route to Ellensburg which bypasses the I-82 summit at Manastash Ridge. Yakima is served by the Yakima Air Terminal, a municipal airport located on the southern edge of the city and is used for general aviation and commercial air service. The FAA identifier is YKM. It has two asphalt runways: 9/27 is 7,604 by 150 feet (2,318 x 46 m) and 4/22 is 3,835 by 150 feet (1,169 x 46 m). Yakima Air Terminal is owned and operated by the city. Yakima is served by one scheduled air carrier (Alaska Airlines) and two non-scheduled carriers (Sun Country Airlines and Xtra Airways). Alaska Airlines provides multiple daily flights to and from Seattle-Tacoma International Airport, Sun Country Airlines provide charter flights to Laughlin, NV and Xtra Airways provide charter flights to Wendover, NV. During World War II the airfield was used by the United States Army Air Forces. The airport at is home to numerous private aircraft, and is a popular test site for military jets and Boeing test flights. Several businesses are located at the airport including Hertz Car Rental, Budget Rent a Car, Airporter Shuttle, Cub Crafters and several freight companies. Yakima's growth in the 20th century was fueled primarily by agriculture. The Yakima Valley produces many fruit crops, including apples, peaches, pears, cherries, and melons. Many vegetables are also produced, including peppers, corn and beans. Most of the nation's hops, a key ingredient in the production of beer, are also grown in the Yakima Valley. Many of the city's residents have come to the valley out of economic necessity and to participate in the picking, processing, marketing and support services for the agricultural economy. The region's retail core has shifted to the town of Union Gap, where a renovated shopping mall and other new retail businesses are flourishing. While some see big-box retail leaving the downtown area as a loss, others see it as an opportunity to recast the downtown area as a center for events, services, entertainment, and smaller, more personal shopping experiences. One part of this effort has been the Downtown Futures Initiative. The DFI has provided for street-to-storefront remodeling along Yakima Avenue throughout the entire downtown core, and includes new pedestrian-friendly lighting, water fountains, planters, banner poles and new trees and hanging baskets, all of which complement the new paver-inlaid sidewalks. A bright spot in the economy of the Yakima Valley is the burgeoning wine industry, due in part to the Yakima Valley soil, which is very similar to the soil conditions of France. Over fifty wineries dot the Yakima Valley, covering more than 11,000 acres (45 km2). In the early 2000s, the city of Yakima, in conjunction with multiple city organizations, began revitalization and preservation efforts in its historic downtown area. The Downtown Yakima Futures Initiative was created to make strategic public investments in sidewalks, lighting and landscaping to encourage further development. As a result, local businesses featuring regional produce, wines, and beers, among other products, have returned to the downtown area. Many of these business are located on Front Street, Yakima Avenue and 1st Street. The city of Yakima has three K–12 public school districts, several private schools, and three post-secondary schools. West Valley High School, in the West Valley School District, is a division 4A school with a student population of around 1,500. East Valley High School, just east of Terrace Heights on the city's eastern side, is in the East Valley School District. It is a 2A school with about 1,000 students. La Salle High School in Union Gap is a Catholic high school in the 1A division and enrolls about 200 students. Riverside Christian School, near East Valley High School, is a private K–12 Christian school. Riverside Christian is a 2B school with around 200 students in grades 9–12. Yakima Adventist Christian School serves Kindergarten through 10th grade. Christ the Teacher Catholic School is a private K–8 school with about 200 students. St. Joseph Marquette is a private school for preschool through grade 8 students. It has about the same number of students as St. Paul's. Homelink is a homeschooling co-op near Davis High School with about 150 students. St. John of Kronstadt Orthodox School is a private school. Oakridge Montessori school serves students from 18 months to grade 8. Westpark Christian Academy, serves preschool through grade 12, with around 80 students. Selah Covenant Christian School and Agapeland Preschool serves preschool through grade 4, with around 100 students. Grace Lutheran School serves preschool to grade 8. Yakima Valley College (YVC) is one of the oldest community colleges in the state of Washington. Founded in 1928, YVC is a public, four-year institution of higher education, and part of one of the most comprehensive community college systems in the nation. It offers programs in adult basic education, English as a Second Language, lower-division arts and sciences, professional and technical education, transfer degrees to in-state universities, and community services. Pacific Northwest University of Health Sciences opened in the fall of 2008, and graduated its first class of osteopathic physicians (D.O.) in 2012. The university has plans to open a PsyD program (clinical psychology) and a masters program in physician assistant studies. The first college on the 42.5-acre (172,000 m2) campus is home to the first medical school approved in the Pacific Northwest in over 60 years, and trains physicians with an osteopathic emphasis. The school's mission is to train primary-care physicians committed to serving rural and underserved communities throughout the Pacific Northwest. It is housed in a state-of-the-art 45,000-square-foot (4,200 m2) facility. According to Arbitron, the Yakima metropolitan area is the 197th largest radio market in the US, serving 196,500 people. Yakima is part of the U.S.'s 114th largest television viewing market, which includes viewers in Pasco, Richland and Kennewick. ^ "American FactFinder". United States Census Bureau. Retrieved 2012-12-19. ^ "U.S. Census Bureau Delivers Washington's 2010 Census Population Totals, Including First Look at Race and Hispanic Origin Data for Legislative Redistricting" (.XLS). U.S. Census Bureau. 2011-02-23. Retrieved 2011-03-26. ^ "State and City Quickfacts". U.S. Census Bureau. Retrieved 2006-11-13. ^ "Hop Economics Working Group". Retrieved 2013-10-19. ^ "City of Yakima History". City of Yakima. Retrieved 2006-12-28. ^ "St. Joseph's Mission, Ahtanum Valley, Tampico vicinity, Yakima County, WA". Historic American Buildings Survey/Historic American Engineering Record. Retrieved 2007-01-11. ^ a b Kershner, Jim (October 16, 2009). "Yakima — Thumbnail History". HistoryLink. Retrieved March 1, 2019. ^ "Ash and aftermath of Mount St. Helens: Our readers remember". Yakima Herald-Republic. May 17, 2015. Retrieved March 1, 2019. ^ "Average Weather for Yakima, WA - Temperature and Precipitation". The Weather Channel. Retrieved 2010-05-15. ^ "2010 Demographic Profile Data". Profile of General Population and Housing Characteristics: 2010. US Census Bureau. Retrieved 20 July 2012. 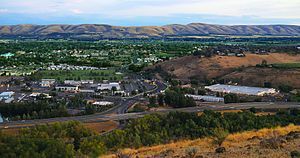 ^ "State & County QuickFacts - Yakima (city), WA". US Census Bureau State & County QuickFacts. US Census Bureau. Retrieved 20 July 2012. ^ "Yakima Folklife Festival". Yakimafolklife.org. Retrieved 2009-03-05. ^ a b "Fresh Hop Ale Festival". Freshopalefestival.com. Retrieved 2009-03-05. ^ "A Case of the Blues and All That Jazz". Festivalnet.com. Retrieved 2014-05-12. ^ "Pahto Public Passage". Yakama Nation Tribal Transit. Retrieved 2012-01-27. ^ "Yakima Valley Major Employers". Greater Yakima Chamber of Commerce. Retrieved 2012-10-07. ^ "Downtown Futures Initiative". Retrieved 2009-03-05. ^ "Farmers' Market". Yakimafarmersmarket.org. Archived from the original on 2009-03-04. Retrieved 2009-03-05. ^ "Hot Shots 3-on-3 Basketball Tournament". Yakimahotshots.org. Archived from the original on 2009-02-27. Retrieved 2009-03-05. ^ "CMA of Washington". Cmacademy.org. Retrieved 2016-08-03. ^ "Yakima Valley Community College Degrees and Certificates". Retrieved 2017-01-05. ^ "Pacific Northwest University of Health Sciences". Retrieved 2007-12-08. ^ Ward, Leah Beth (August 8, 2008). "Pacific NW University Will Add Two Colleges". Yakima Herald-Republic. Retrieved December 27, 2011. ^ "New osteopathic school planned for Yakima". Puget Sound Business Journal. April 14, 2005. Retrieved 2007-02-03. ^ "Arbitron Radio Market Rankings: Spring 2012". Arbotron. Retrieved 20 July 2012. ^ "Local Television Market Universe Estimates" (PDF). Nielson. Retrieved 14 April 2019. ^ "Oleta Adams Biography". Retrieved 19 July 2012. ^ "Jamie Allen Stats". Baseball Almanac. Baseball Almanac. Retrieved 19 July 2012. ^ a b Jenkins, Sarah (2 April 2006). "Their claim is fame - and a link to the Valley". Yakima Herald-Republic. Retrieved 19 July 2012. ^ Muir, Pat (17 September 2010). "Outtakes from the Garret Dillahunt interview". Yakima Herald Republic. Retrieved 19 July 2012. ^ a b c d e f "Most Popular People Born In Yakima, Washington, USA". Internet Movie Data Base (IMDb). Amazon.com. Retrieved 19 July 2012. ^ Ward, Leah (23 August 2009). "Larry Knechtel, a music legend, dies at 69". Yakima Herald Republic. Retrieved 19 July 2012. ^ "James Walter Nolan, Jr. (Obituary)". Yakima Herald-Republic. 24 March 2004. Retrieved 19 July 2012. ^ "Jim Pomeroy at the Motorcycle Hall of Fame". motorcyclemuseum.org. Retrieved 29 November 2018. ^ "Creek actor Will Sampson honored with spot on Oklahoma Walk of Fame". Muscogee (Creek) Nation. Muscogee (Creek) Nation. Archived from the original on 1 March 2012. Retrieved 19 July 2012. Wikivoyage has a travel guide for Yakima.